Gill Giese joined New Mexico State University in July as its Extension viticulture specialist. Giese spent the last four years as a commercial winemaker at Shelton Vineyards in Dobson, North Carolina. Spanning over 100 acres, more than 400 tons of grapes are grown and processed from the vineyard each year, where Giese and his staff bottled between 25,000 and 30,000 bottles of wine annually. 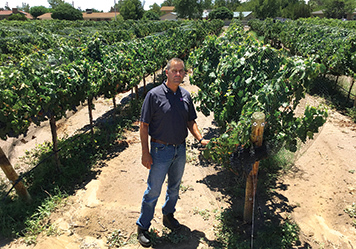 Giese brings his viticultural and winemaking knowledge to the NMSU College of Agricultural, Consumer and Environmental Sciences. Giese – who is located at the Agricultural Science Center at Los Lunas – also serves as an assistant professor for NMSU Extension Plant Sciences. For 12 years, he was the lead instructor for viticulture and enology at Surry Community College, also in Dobson. Giese earned his doctorate in horticulture from Virginia Tech. He received a bachelor of science in agriculture and master of science in horticulture from the University of Arkansas. Not only did he teach at Surry Community College, he established its viticulture and enology two-year degree program and curriculum. As a research specialist for six years with the University of Arkansas Food Science Department, he managed a six-acre research vineyard and pilot winery. Giese’s appointment at NMSU is 75 percent Extension and 25 percent research. This combination – in addition to the state’s unique wine industry – is what attracted him to NMSU. The growing conditions in New Mexico are challenging mainly due to the wide variety and diversity of vineyard sites, as well as significant changes in temperature. “I’ve been talking to New Mexico winegrowers who have been successful overcoming different challenges, such as heat during ripening and survivability during the winter,” Giese said. In addition to addressing growing challenges, one of Giese’s priorities is to help growers increase both quality and production efficiency. Giese understands the importance of the economic impact the wine industry has on the state. Gill Giese joined New Mexico State University July 3 as the Extension viticulture specialist.